[CHICKEN UP] Have you ever wondered how your favorite UFO Snow Squid Topokki is made? [CHICKEN UP] Great Deals to kick off a brand new year! [CHICKEN UP] Time to punch out and gather ‘round! [CHICKEN UP] You can’t think of anything else but Chicken Up after watching this! [CHICKEN UP] Nothing beats our well-loved Original Fried Chicken Flavors! [CHICKEN UP] DUE TO OVERWHELMING POPULAR DEMANDWe are EXTENDING our Exclusive Food Panda offer this September! We are EXTENDING our Exclusive Food Panda offer this September! 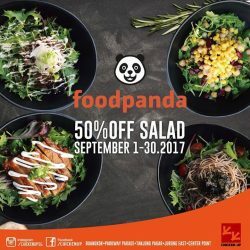 Avail 50% OFF on Chicken Up Salads for Food Panda Deliveries! Simply CLICK on the Foodpanda order link below, KEY IN your location and you'll be directed to the outlet nearest you! KEY IN YOUR ORDERS NOW! -Available at all Chicken Up outlets except Chicken Up Little Star Vista. -Valid from August 1-31, 2017 only. -Price excludes Delivery Fee and GST charges. -Not valid in conjunction with other promotions. 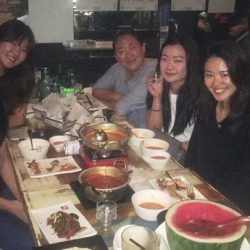 These Ladies sure had their Wednesday Night well spent as they enjoyed Chicken Up's Ladies Night with their FREE Watermelon Soju and Watermelon Bingsu! [CHICKEN UP] Depends on how you heard it, but we’d rather have you hearing extra FRIES! rather have you hearing extra FRIES! 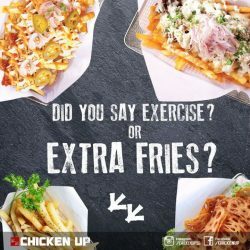 So forget about excercise and grab a heap of Chicken Up Fries now! 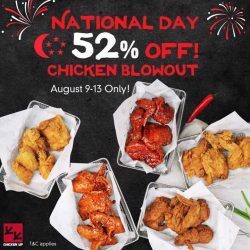 [CHICKEN UP] Celebrate freedom at Chicken Up this National Holiday with our delectable fried chicken creations at 52% OFF! -Promo is valid from August 9-13 only. -Not valid in conjunction with other ongoing promotions, offers, discounts, privileges and vouchers. [CHICKEN UP] CONGRATULATIONS TO OUR UFO GIVEAWAY WINNERS! 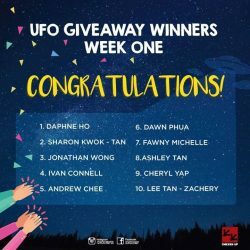 CONGRATULATIONS TO OUR UFO GIVEAWAY WINNERS!!! Each winner gets to enjoy ONE SET of UFO PLATTER with their family and friends! Winners will be notified personally through Facebook messenger for claiming instructions. Thanks to everyone who participated in our week one UFO GIVEAWAY! BUT!!! Stay tuned for our BIG ANNOUNCEMENT TOMORROW! The UFO GIVEAWAY EXCITEMENT continues! [CHICKEN UP] How about good fun, cooking experience with our professional skilled chef? 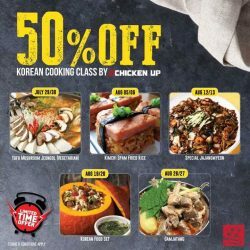 Chicken Up’s Korean Cooking Class has (2) new promotions! With this, you get to register with your friend for only $75! Or, you can also register for 2 different classes at $75! And if you’re a student, you can present your Student ID and enjoy the 50% discount! Hence, it will be $25 for one session. Join our Cooking Class at Chicken Up, The CentrePoint (176 Orchard Road #01-33H Singapore) every weekend from 3:00 pm until 5:00 pm. Promotion starts this July 16 until 31 August 2017 only. 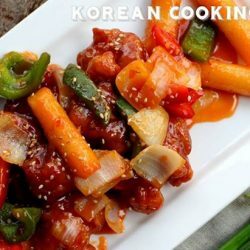 Anyone is welcome to join our Korean Cooking Class, whether you’re just starting out or a skilled cook with years of experience. Don't miss the fun! Invite your friends and family and expect more exciting perks during the actual cooking class sessions. 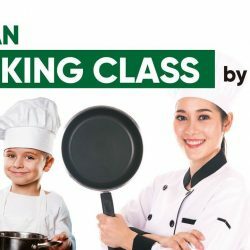 For reservation or advanced registration, email [email protected] or register by signing up online by clicking this link: http://www.chicken-up.com/#cooking-class. [CHICKEN UP] Everything you love about KOREAN FRIED CHICKEN and so much MORE! Everything you love about KOREAN FRIED CHICKEN and so much MORE!!! Truly a haven for Korean Food Lovers! Check out this video for a taste on some of our drool-worthy offers! These and a whole lot more awaits you only at CHICKEN UP! [CHICKEN UP] Boneless Chicken Cooking Class, Day 1! Boneless Chicken Cooking Class, Day 1! You ready to cook with our talented and professional chef, Chef Gao Yong? Cook this bite sized boneless chicken pieces which where you can enjoy eating chicken without fuss. This has become a recent food craze in Korea next to Korean Fried Chicken. This dish is easy and quick to make and it will surely satisfy your chicken craving. Lot's of exciting perks awaits once you register! You can get 1 FREE when you register 3! Wait no more, contact us and register! [CHICKEN UP] Say hello to Day 2! Second day of Boneless Chicken Cooking Class. Missed our Saturday Cooking class? No worries, join our Sunday Cooking Class! 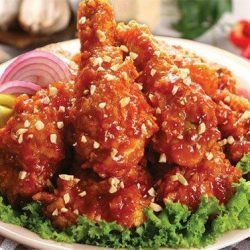 Our CHICKEN UP PARKWAY PARADE outlet serves authentic Korean fried chicken in different varieties, classic Korean food items with a twist and Instagram-worthy desserts to make your usual restaurant visit an unforgettable treat. It is a great spot for family meals and meeting place for groups! 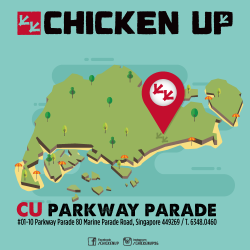 Visit Chicken Up Parkway Parade outlet located at #01-10 Parkway Parade, 80 Marine Parade Road, Singapore. 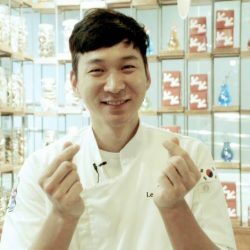 [CHICKEN UP] KOREAN COOKING CLASS UPDATE! Join our Korean Cooking Class this weekend with our talented and professional chef, Chef Gao Yong in cooking Boneless Chicken! This dish is made with bite sized boneless chicken pieces which where you can enjoy eating chicken without fuss. This has become a recent food craze in Korea next to Korean Fried Chicken. [CHICKEN UP] Hear what our customer have to say about our food and her ultimate dining experience with us! Hear what our customer have to say about our food and her ultimate dining experience with us! Have you tried any of our menu offerings? [CHICKEN UP] Cheers for this great news! Cheers for this great news! Due to insistent public demand, we’re extending our All Day- Everyday Free Flow to all Ladies and Gentlemen! What makes it even more awesome? There’s no minimum spending required! You’re in for a crazy good time ALL DAY- EVERYDAY only at Chicken Up Centrepoint! 1. Free flow Makgeolli cocktails valid for 2 hours upon order per availing customer. 2. No Sharing of Drinks. 3. Free flow open for men and women every day except Friday. 4. Valid for Dine in customers only. No separating of bill and table. 5. Not valid in conjunction with other promotions and discounts. 6. 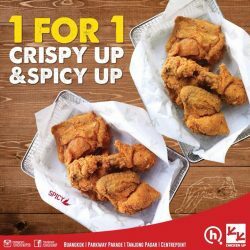 Valid at Chicken Up Centrepoint only. Learn how to cook this irresistible spicy soup that is loaded with a generous amount of seafood and bulgogi this weekend with our experienced Chicken Up chefs. A bowl of jjambbong contains all the nutrients we need for a wholesome, nourishing, and well-balanced meal. This noodle soup is one of the most requested dishes in Korea! Find out by joining our Korean cooking class! [CHICKEN UP] Jjambong Rice Cooking Class adventure continues. Second day of Cooking one of the most requested dishes in Korea. Learn the secrets of how to make this spicy-yummy red soup. 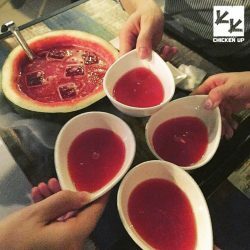 [CHICKEN UP] Cooking Class UpdateIt’s almost the weekend, It’s cooking time! It's almost the weekend, It's cooking time! This weekend, we will be cooking Jjambbong Soup with RICE! One of the most popular Korean-Chinese dishes. 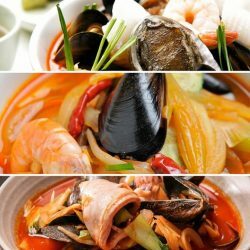 An irresistible spicy soup that is loaded with a generous amount of seafood and the combination of all the natural ingredients creates a hearty bowl of soup that is packed with robust flavours. The spiciness will surely clear your sinuses! No worries, you can still register for Saturday Cooking Class and Sunday Cooking Class. Ladies! If you're up for a night that's lit, drop by at any of our Chicken Up outlets and savor the VIP treatment that we've been giving to all our lady guests. Hurry in and enjoy complimentary Watermelon Soju or Watermelon Bingsu for a minimum purchase. 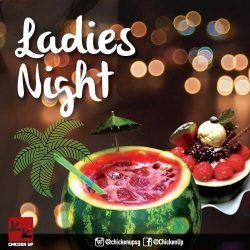 Experience an epic Ladies Night only at Chicken Up! 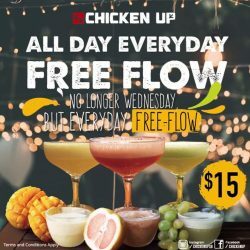 Chicken Up's WEDNESDAY LADIES NIGHT is offered at all outlets except Star Vista. Promo is applicable for Dine-in customers only. [CHICKEN UP] Now Mark your Tuesdays! 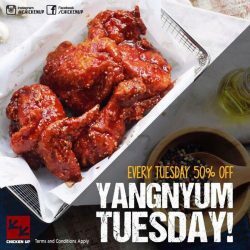 We are offering Yangnyum Up (Half-Chicken) for 50% OFF every TUESDAY! Yes, you’ve read it right! Our all time favourite Chicken lathered generously with Korea’s most popular and flavourful sauce, Yangnyum, finished off with a sprinkle of sesame seeds. Our Yangnyum Up Chicken has a sweet and tangy taste, a variety you will ultimately crave for! For Spice Lovers, our Spicy Yangnyum Up is also available on 50% OFF! Your Tuesday’s will never be the same again, with Yangnyum Up Chicken! 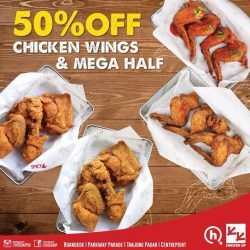 Head now to your nearest Chicken Up outlet and avail of this sweet deal! 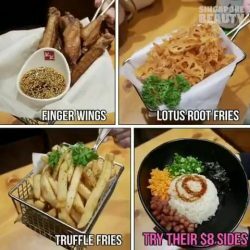 Available at all Chicken Up Singapore Outlets except Chicken Up Little- Star Vista. Valid for Dine-in customers only. Valid from Opening until Closing. Valid for Half Chicken only. Price may vary per branch according to GST and Service Charge applicable. It's hard to find a hangout spot with a good food and relaxing ambiance, perfect for drinking and snacking in a group. 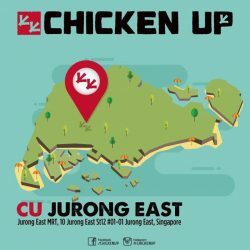 CHICKEN UP JURONG EAST outlet has been around for years, serving wide selection of menu offerings and fantastic set meals to hungry diners. 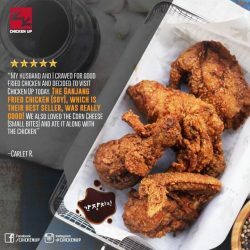 Visit Chicken Up Jurong East outlet located at Jurong East MRT, 10 Jurong East St12 #01-01 Jurong East, Singapore. Check out our current promotions and make your reservations today!